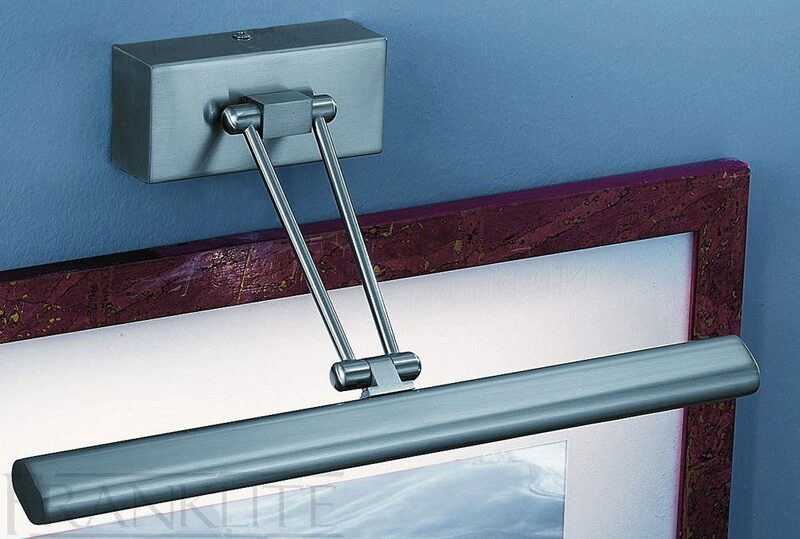 This Franklite modern satin nickel finish 365mm adjustable picture light features a rectangular wall mount, dual arms and flat profile adjustable head. Designed with adjustable joints at the wall mount and head to allow maximum adjustment. Use this directional light to make the most of your precious art and family portraits. The modern design and satin nickel finish combine to create a fitting that adds character to any room and is an ideal solution for any wall in your home. This modern light is supplied by Franklite Lighting who have been one of the pioneers in the design, manufacture and distribution of high quality lighting such as the modern satin nickel finish 365mm adjustable picture light you see here. Please advise the K of the crisp white light description? Hello Nigel. This picture light takes a standard mains voltage G9 halogen capsule which have a colour temperature of 2700K. If desired this can be changed by using LED G9 which are available in a range of different colour temperatures. Kindest Regards.